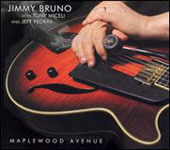 Jimmy Bruno, born July 22, 1953 in Philadelphia, Pennsylvania, is a master jazz guitarist and jazz educator. 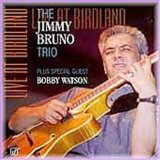 One of the most critically acclaimed jazz guitarist performing today, Jimmy Bruno came to prominence as a jazz musician in the 1990’s, after a successful twenty-year career as a sought-after commercial guitarist and session musician. 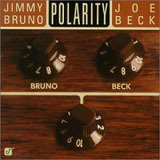 Those were the words that began Jimmy Bruno’s professional career as a guitarist. Most of the other guitarists auditioning for Buddy Rich’s band that day in 1973 were getting drumsticks thrown at them, Buddy’s not-so-subtle way of showing disapproval. But not 19 year-old Jimmy; he got the gig. A Philadelphia native, he was born into a family no strangers to the music world. Jimmy’s father played guitar on the 1959 hit “Guitar Boogie Shuffle” with Frank Virtue. Jimmy’s mom was a gifted singer. Living in such a musical household, playing guitar 8 to 10 hours a day was normal for this south Philly kid. He hungrily soaked up everything his father could teach him, landing on national television at age 13, the winner of the Ted Mack Original Amateur Hour. Soon he was studying jazz improvisation with local bass legend Al Stauffer. To develop technique, he taught himself to play the violin etudes of Wohlfahrt and Paganini. Although he briefly considered leveraging his perfect SAT scores into medical school, a summer guitar gig in Wildwood NJ (with Larry Cartell), changed the direction of Jimmy’s life forever. He was 17 and has never had a job unrelated to guitar playing since. After a whirlwind round-the-world tour as the youngest member of the Buddy Rich Orchestra, he went on to play guitar in orchestras for Frank Sinatra, Wayne Newton, Lena Horne, and many more music icons. During his years as an LA session musician with Tommy Tedesco, Jimmy played on dozens of TV and film scores. But his first love was always jazz, and by the time he was in his mid-thirties he was ready to come out of the background and into the spotlight. Paying his dues by playing blistering guitar in the small clubs and venues around his beloved Philadelphia during the 1980’s, his reputation as one of the hottest guitar players grew. In 1992 he landed a multi-CD recording deal with legendary jazz label Concord Records. Since then Jimmy has recorded over 13 critically acclaimed CDs, including “Sleight of Hand,” “Like That,” and “Polarity.” His most recent CD “Maplewood Avenue” (Affiliated Artists Records) was described as having “…a 'classic' feel to it...like a famous album we somehow hadn't discovered yet.” Jimmy performs constantly as leader of the Jimmy Bruno Trio in jazz venues and jazz festivals around the world, including the Iridium in New York and Blues Alley in Washington DC. He is often described as one of the greatest jazz guitarists of all time. Jimmy Bruno and Chuck Anderson work on a new recording project! New John Leitham/Jimmy Bruno CD-"Two For The Road"
Improvisation is the heart of jazz. I'll show you how to do right; give you exercises to lock it in tight. I’ll teach you the fundamentals of chords and chord soloing (you'll never need a chord encyclopedia again). It’s all about the music. We’ll apply what you’ve learned to the song of your choice (or I’ll get you started on tone of the jazz standards). I'll teach you how to practice productively. No more wasted time. Jimmy Bruno Guitar Institute is the best way to learn guitar from me now. I have found that my online students are learning faster than my private students. You can watch the videos I've posted (there are over 500 videos and Master Classes to learn from) any time you want. I don't charge and extra fee for anything. As you practice your way through the lessons, upload a video to me and I will respond with my comments and next assignment. Often I respond with a video so that the other students can learn along with you. Sometimes an email will keep you on the right track, but to get the most out of the Institute and having access to me, you should post a video. We start with the very basics of jazz and the lessons evolve into improvising as well as tune analysis. The lesson material is very comprehensive and the very active worldwide community of guitarists helps with many questions and jazz related topics. All About Jazz musician pages are maintained by musicians, publicists and trusted members like you. Interested? 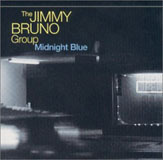 Tell us why you would like to improve the Jimmy Bruno musician page.